Seven years after General Motors filed for bankruptcy in June 2009, the automotive giant is alive and well, having undergone a massive transformation that turned its fate around. Local distributor of GM brands Chevrolet and Cadillac, IMPEX, just won the prestigious General Motors Grandmasters Award for the fifth time. 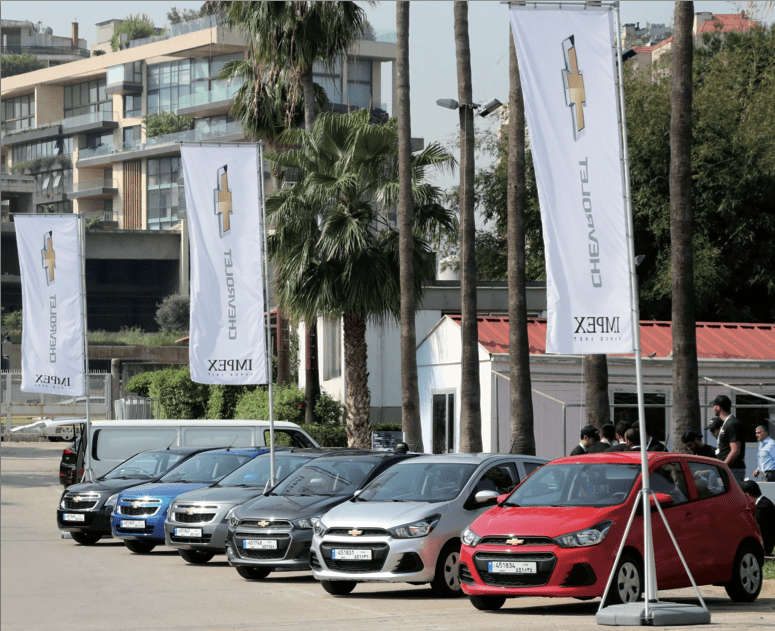 Managing Director for Commercial Operations at GM Middle East, Markus Leithe, visited Lebanon in April with other GM executives to bestow the award and launch the 2016 Chevrolet Spark and Cobalt. In his position Leithe oversees the UAE, Kuwait, Bahrain, Qatar, Oman, Iraq, Jordan, Lebanon, Afghanistan and Yemen – definitely a diverse group of markets for a single region. Executive sat down with Leithe to ask just how far GM cars will take us into the future. Why was IMPEX awarded the GM Grandmasters award? What does this mean for IMPEX? It’s first and foremost a prestigious award. On a yearly basis we have the Grandmasters Award [competition]and we’ve been doing it for many years. It’s based on criteria such as sales results and customer satisfaction. We are awarding the best of the best so it’s tough criteria, not just numbers; you need to do more than that. IMPEX has done a really good job in achieving this. There are three other [dealers]that won the award regionally, one in Oman and two in Saudi Arabia, but the award is not just for the region. It’s a global award and that’s why it’s so prestigious, because only a few in the world can win. GM has seen a massive transformation since its 2009 bankruptcy. What were the pillars of this transformation? I think very often people get too satisfied and don’t challenge themselves anymore and this was one of the reasons [for the bankruptcy]; we were so involved with ourselves that we didn’t look at what was happening out there. We were always proud to be the biggest [automotive company], but size alone doesn’t help you survive at the end of the day and it took us a long time to realize that you also need to make money. I think it was a good thing, a very rough spot, but also a very healthy one. We learned modesty and humbleness again and started to look into how things need to be done differently. We hired many people from outside and kept the really good people that were within GM, and we listened to these people. I’ve been with GM since 1998 and the difference that we see since the bankruptcy – it’s a completely different company. The way we did business then is 180 degrees different from the way we are doing business now. We are way more accountable, we are really listening to the customer – it’s not a tagline. We are really focusing so much more on what is the right thing to do, the right product we need to bring out. For example look at the Cobalt. We didn’t plan [to market]this vehicle for the region at the beginning, but then we realized that we have a small country called Lebanon and people here are different from the people in Dubai. They don’t have the [same]income, they don’t want big cars, they want smaller cars that have all the comfort and features of a big, expensive car. These are the ways in which we have become more detail oriented. We listen more. In the past this wouldn’t have happened. A car is no longer just an engine on four wheels. What kind of new technology is Chevrolet introducing? The way we’ve used cars in the last 50 years will be completely different from what we do in the next few years. What we will see is a huge paradigm shift: autonomous driving, electric cars, car sharing – this will all happen 100 percent. For us it’s important that we are a part of this change. And again, this shows you the new GM [strategy], maybe we can’t do it all ourselves but we need to insource those people from somewhere else. GM global is buying a lot of companies, a lot of startups with young, smart people who are more advanced in that regard; Lyft is one of them. Just because you’re big and successful today, doesn’t mean you will be in a couple of years. That’s the key focus for us and you’ll see it with [car]technology, it starts with small things like Bluetooth, Apple CarPlay, all these features that are very important for connectivity. People today are demanding [to be connected]and we need to make sure that we can enable that. Electric cars are also very important. We don’t have them here for the region, but on the global level in the United States we are very successful with the Bolt, so we are on the forefront. This region is a little bit different because it’s an expensive technology and in the GCC region you have climate issues; the efficiency of electric cars in a hot or cold climate is not as good as it is with gas-fueled cars. Plus in the GCC gas is cheap so why would you buy [an electric car]? We are looking into bringing some of these cars to this region, especially Lebanon and Jordan, but there’s nothing we can announce yet. How does Chevrolet compare to other car manufacturers in terms of road safety? We have a lot of technology now that not only keeps you in the lane but automatically stops [the car]. You can [activate]cruise control and if the car in front of you stops you will stop without any doubt. Even if you’re driving regularly you get an alert and it will stop you so the chances of having an accident are becoming fewer. That technology makes it very easy to make a really safe car. We don’t have it in the very small cars yet but the new Malibu [to be launched soon in Lebanon]will have it. The edge is always the design of our cars. We have very good ratings for our emotional design. If you have the right passion you will want to design beautiful cars and this is exactly what we are trying to do. We make beautiful cars that people like to be in, while still having all the rational reasons to buy the car. We have really good value in our vehicles, we have a good idea of what people want and we make sure that they get what they want at the price they are prepared pay. Technology is one of our key areas, not just for the sake of technology but technology that means something for people: things like a cooled glove box, which is very easy to make and you can store your drinks and chocolates inside. We also have all the safety features that are important to us; they are expensive to produce but we want our drivers to be safe in their cars. Fuel economy is something that we are strong on too. I think there’s a lot that we are doing really well and better than our competition; it’s never one thing, it’s a comprehensive product. Here in Lebanon it’s small cars like the Spark and Cobalt. Regionally there’s the Cruze and Malibu sedans, and big SUVs like the Tahoe. In the GCC in particular pick up trucks are doing very well. Are there any specific challenges in the Lebanese market? In Lebanon the challenge is always the import tax system. It means people can’t buy new cars. I see a lot of old cars on the road, and I think it’s not safe for people to be in cars that old and it’s not good for the environment. It’s something we all have to live with but it’s a decision made by the government and we respect it. The Lebanese market is also very different from the market that I deal with in the GCC, where [they buy]big cars, fuel cost is low, and many people are quite wealthy. In Lebanon you have different requirements: mountainous areas, cold winters, fuel is expensive and people’s income is not as high in the GCC. I wouldn’t necessarily call these challenges, you just have to listen to the customers and make sure to provide the right product. Again, the Cobalt is the perfect example. I wouldn’t bring it to the GCC because the market is not there, but here there is a market and it can become very successful. The Cobalt is bigger than the Spark. The Spark is the smallest Chevrolet we have but it’s actually the biggest in its category. Compared to the old Spark, which was a very small car, the new Spark is bigger, with a bigger engine and the features are much more advanced. How are sales in the region? At the moment it’s a little bit tough. We are still rising, but it’s not like in the last few years when everything went up. We need to work a little bit harder now but we are still doing really well. Are you applying any new strategies moving forward? We need consistency in our strategy and I think in the past we changed our strategies too quickly. Now we have a good idea of what we want to achieve and how we can achieve it so there’s no reason to move away from the current strategy. We are on the right track but the market is a little tougher now than it was a couple of years ago. Chevrolet’s slogan “Find New Roads” is more than a tagline, it’s the way we want to think, look for opportunities, see what we can do better or differently, without saying everything needs to change for the sake of change. We are trying to bring more vehicles that fit the market well; we want to have the right portfolio. Customers are not the same everywhere and their requirements are very different, not just around the globe but also within our region. How does the Middle Eastern market compare to the rest of the world? It’s very different. The significant difference in the Middle East is in the oil prices, it’s something that’s very particular to this region. On the positive side fuel price is not that important for the customer in the GCC and they can afford big cars. At the same time the impact of the oil price on the overall economy is huge, even for Lebanon because of all the expats living in the GCC and all the money that flows back into Lebanon. This impact is very strong and you see [the effects]immediately; when oil prices drop, investment drops, people don’t get raises, there’s less employment. There’s never a bad market, just a different market. You need to have different strategies and I think we are doing that well.